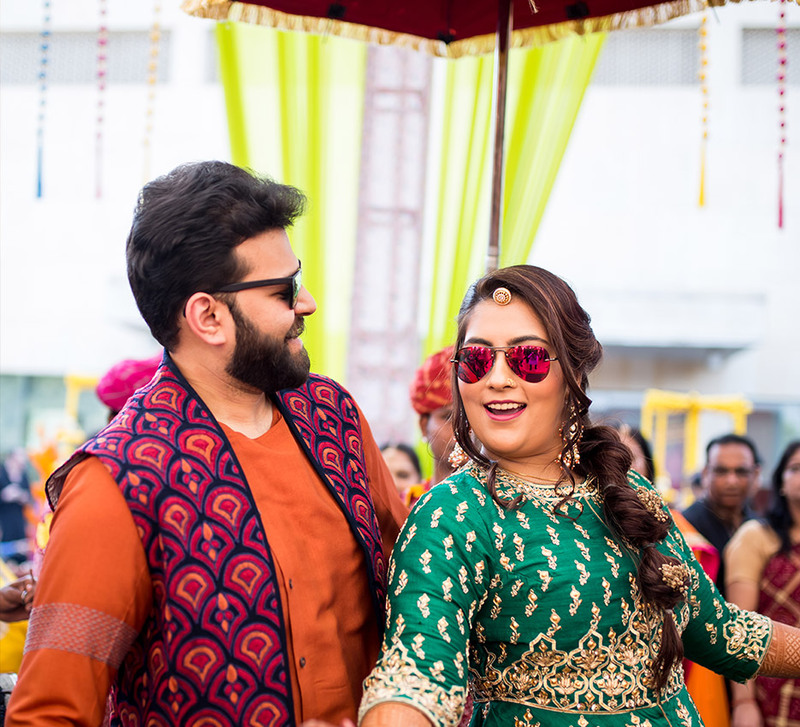 From the cheery yellow vibe of the haldi ceremony to the regal red of the wedding, Sachi and Ayush's wedding served up a spectrum of colors and celebratory spirits. Sachi and Aayush’s wedding in Bengaluru was a fun and intimate affair where guests relished wonderful food, wow dance performances and well-planned decor for separate events. The colorful festivities were captured by WeddingSutra Favorite - House on the Clouds. Take a peep into all the action that went down here. Their nuptials began with a fun 'Welcome Party' where the venue was decked with lots of origami-themed quirky decor elements, such as colorful hangings made using pastel colored papers, a photo booth created with a painted wooden wall with windows and white chairs, a few game setups and more. Sachi looked radiant in a beautiful sea green lehenga, while Aayush sported a crisp white kurta with a powder pink jacket. The guests relished great food and live performances at this function. The haldi ceremony was an intimate affair with only the close family and friends in attendance. A beautiful setup was created with fresh florals making it an elegant affair. The vibrant decor for the function included shades of yellow in elements such as drapes and flowers, which turned out to be beautiful and cheery. The haldi was followed by a sangeet where the stage was set for wonderful performances, and the lighting arrangements added to the mood of the evening. All the dances performed that evening were entertaining, and the couple couldn’t stop dancing until late into the night! Adorned with warm lights, floral arrangements, and drapes, the set-up for the wedding looked no less than a stunning wonderland! Sachi and Ayush looked like a royal couple in their ensembles. Sachi wore a red lehenga by Sabyasachi Mukherjee which she paired with a matching dupatta. Aayush picked an ivory sherwani and his neckpiece complemented her outfit.